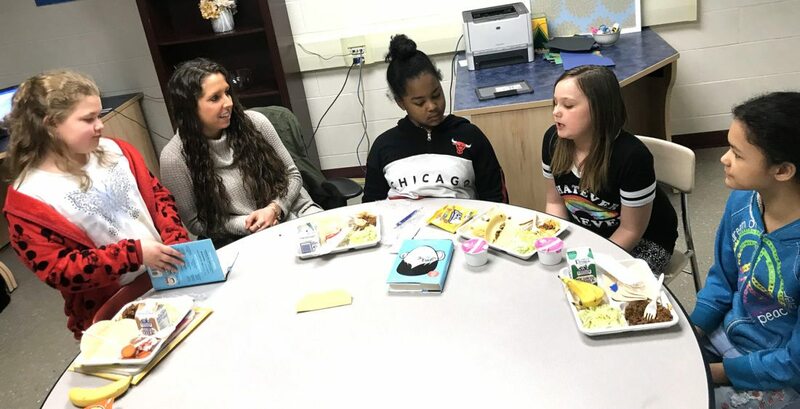 Persell Middle School students Chloe Lewis, Aaliyha Rosario, Katelyn Schroder and Cheyenne Smith eat lunch and participate in a Book Club with JCC’s Liberty Partnership Grant Program Navigator, Lindsey Rensel. “What did you learn from reading Wonder?” asked Lindsey Rensel during a recent Book Club. “That just because you are different, it doesn’t mean that you don’t have something really meaningful to add to life. That we shouldn’t judge people by the outside, but what’s inside,” said one of the students. 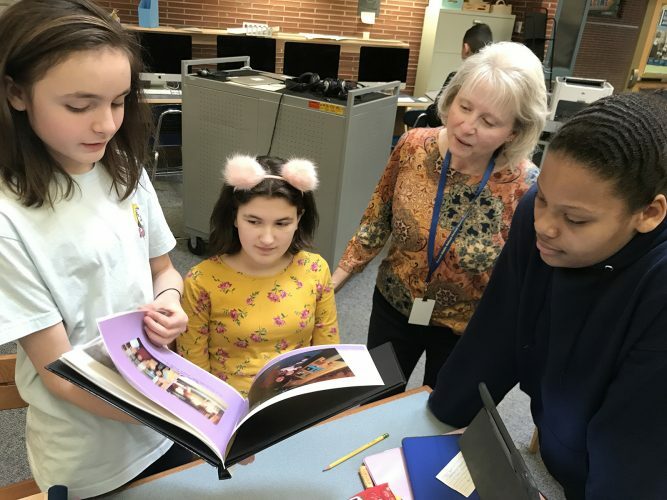 Ms. Rensel held the Book Club as just one of her many responsibilities as a “navigator” with the Liberty Partnership Grant Program through Jamestown Community College. The Book Club is currently reading Wonder, a children’s novel by R.J. Palacio and movie, which follows the story of a fifth grader, August Pullman, who suffers from a facial deformity and his experiences with bullying and how he handled it. Reading different books during the lunchtime club gives students the opportunity to talk about social and emotional issues in a safe environment with Ms. Rensel. The Book Club is just one of the benefits of having Ms. Rensel in not only Persell Middle School, but all three Jamestown middle schools. 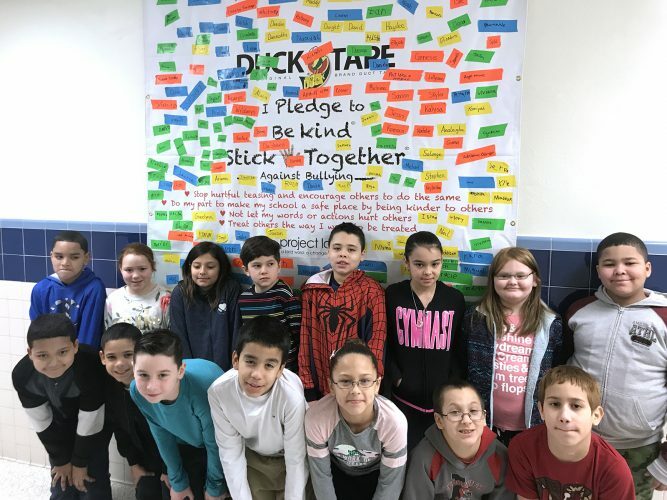 Jamestown Public Schools is one of the lucky recipients of Jamestown Community College’s five-year, $2,250,000 Liberty Partnerships Program (LPP) Grant from the New York State Education Department. The grant provides services through which students can master core skills that prepare them for college and careers after high school graduation. LPP was developed to reduce the number of New York state middle and high school students who are at risk for dropping out of school. Jamestown Schools currently has two “navigators” through the grant, one at Jamestown High School, John Kinder, and Ms. Rensel. The navigators provide an array of support services, including academic support, personalized learning plans, leadership and summer enrichment opportunities, after school clubs, study skill support, and career and college preparation activities. 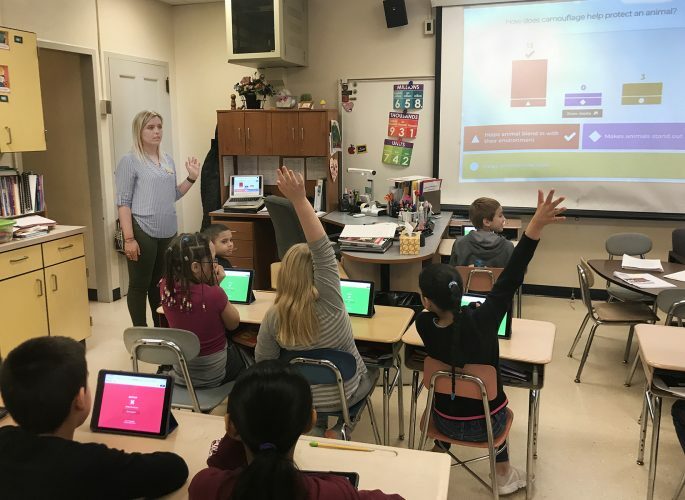 The grant is currently serving 85 middle school students and 107 JHS students with the navigators creating personalized learning plans to help students create goals and track progress. 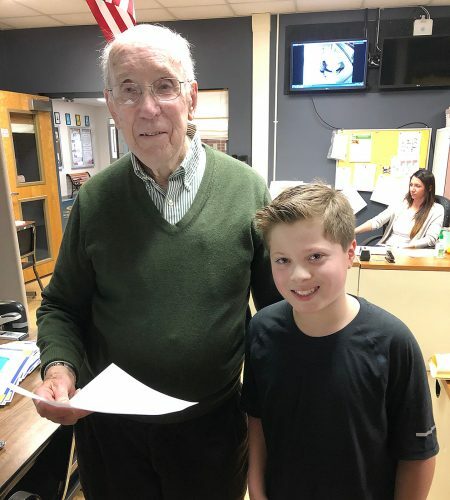 As this is the first year of the grant, Ms. Rensel has been very busy this year at Persell and the other middle schools enrolling students and creating a foundation for the program. Some of LPP programs at the middle school level are: parent involvement/meetings, the importance of healthy relationships, career/college visits, overnight event at Camp Onyahsa, leadership day at Mission Meadows, summer programming including a partnership with Chautauqua Institution, community service involvement, developing soft skills and professional development support to school staff. 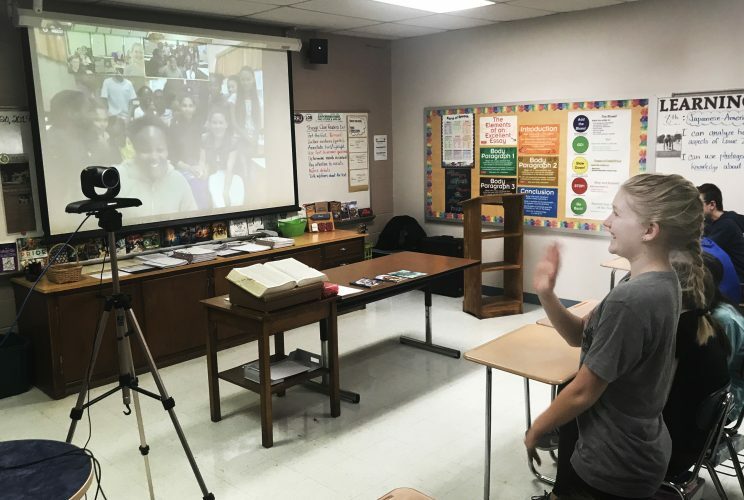 “We have a great team and we are continuously thinking of programs, events, trips and experiences to incorporate into LPP to make it a great experience for the students involved,” said Ms. Rensel. LPP is also collaborating with the Chautauqua Leadership Network, a community-based organization whose members will also provide students with leadership mentoring and career exploration opportunities. 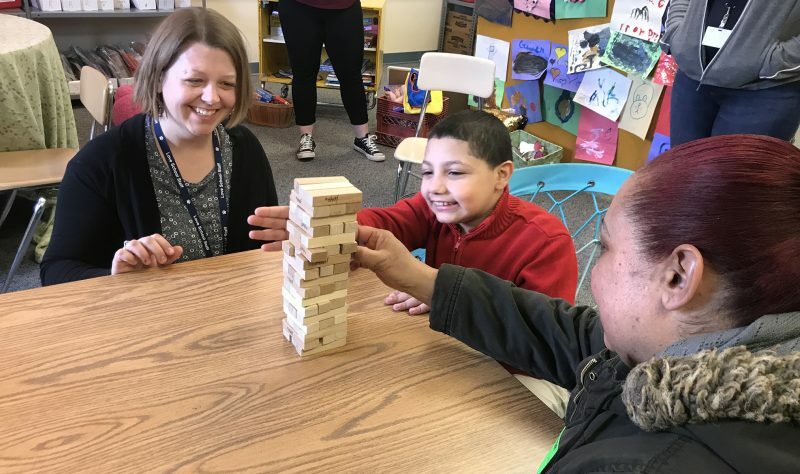 Other personnel include outreach coordinator Laura Turnbull, a licensed social worker who provides case management support to LPP families and navigators, and student services assistant Rachel Irish.